One chilly Sunday afternoon in the winter of 1994, Curt Eshelman and Allen Wilcox took a walk through Durham’s old tobacco district. These two friends and their families live in Trinity Park, a nearby neighborhood. The tobacco warehouse district had once been a bustling corner of Durham, but the auctions and minor-league baseball games had faded away, leaving weedy lots and silent streets. Curt and Allen began to daydream about how new life might be brought to this area. Their enthusiasm was contagious. Working with Bill Kalkhof at Downtown Durham, Inc., Curt and Allen enlisted community support to create a new vision for this neighborhood – a vision that included an urban park. The park would provide a place for public art, picnics, concerts, and community gatherings – a catalyst for the neighborhood, and a venue that would serve the whole city. Step by step, their dream is becoming a reality. 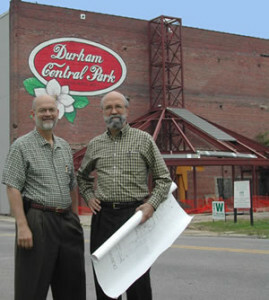 The park is being created through a public/private partnership between the City of Durham (which purchased the land), Durham Central Park, Inc., a nonprofit volunteer organization responsible for developing the park, local businesses and non-profit organizations that have adopted sections of the Park, and hundreds of volunteers who come out for workdays to maintain and improve the Park. Signs of progress are dramatic, from the distinctive magnolia mural on the Liberty Warehouse to the Farmer’s Market Pavilion to the Skate Park. The Liberty Arts Pavilion includes a foundry where “Major,” Durham’s signature bull sculpture, was created. While a lively downtown park is a great asset, the goal has never been just a park. The vision is to rejuvenate a neighborhood, and in so doing contribute to the renaissance of downtown Durham. Artists’ studios, restaurants, a brewery, a music club, and a new public charter school have opened in this area. Every week, thousands of people shop at the farmers’ market and the crafts market. There are weddings, summer movies on the lawn, and free music and dance concerts. The momentum is tremendous — but we’re not done yet! You can help complete the construction of Durham Central Park, and make this community vision a reality. Become a Friend of Durham Central Park, or contribute your time as a volunteer. Join us today!